The Brecon Ultra was to be my final significant race of the season. It was a chance to race against some serious ultra runners and hopefully seal what has been a terrific 12 month in Ultra Trail running. The 2010 event was my first ultra trail run. I really enjoyed myself and it became the catalyst for a season devoted both to triathlon and ultra trail racing. Last year Mark Palmer won for the third consecutive time to break his own course record with a time of 6hr22. I was pleased to take 2nd place with 6hr49. This year we were told there were record holders, world champions and race winners in their own right lining up to take on the 46mile (2 lap) race. I noticed one or two names from long-distance triathlon but I’d also been informed of some ultra running stars. The Brecon Ultra also includes a team event – 3 members per team (aggregate times minus 1hr per female). Elagen were good enough to provide sponsorship for four teams in the event. They supplied both Elagen Sport and Beta Alanine pills. Racing for a team was going to have its positives and negatives. Shaw, Peter and myself were all slightly damaged goods going into the race and we knew that wimping out after the first lap was no longer a viable option unless strictly necessary. Peter had a nasty bike crash in Hawaii that put him in hospital (and out of the World Ironman Champs). Shaw had a leg injury, and I was a little unsure how my weak ‘post-Caesars Camp’ knees would handle the stony terrain of the Brecon course. The race is a 2 x 22.5mile lap starting and finishing at Talybont. It is a mixture of canal path, fields and trails up and down some of the Brecon Beacon summits, with a few miles of road. You can see from the lap times that the stony surfaces and steep ascents take a lot out of the runners legs, and I’ve yet to see any second lap splits get close to first lap splits. The race is organised and run by Martin and Sue Like who are an awesome couple. I’ve known them for several years, and can say they are one of the most friendly and enthusiast couple you could meet. You can certainly see why the Brecon Ultra is such a popular event amongst trail runners and fills up in 48hrs! I said going into the race that I would be more than happy with a <7hr time and/or top5. After what I’d put my body and mind through on the 100mile race just 4 weeks earlier, I really didn’t expect to be at 100%. I had to be realistic and I also had to be careful I didn’t get too carried away at the beginning of what would be a higher standard race with people going hard from the off. Mark Palmer was back to defend his title again and I knew he’d be on good form having done the Bob Graham Round in <15hrs in the summer amongst other amazing achievements. It was his race to lose you could say! At 7:30am we all lined up on the canal and after a short lead-in speech by Martin, we were off! 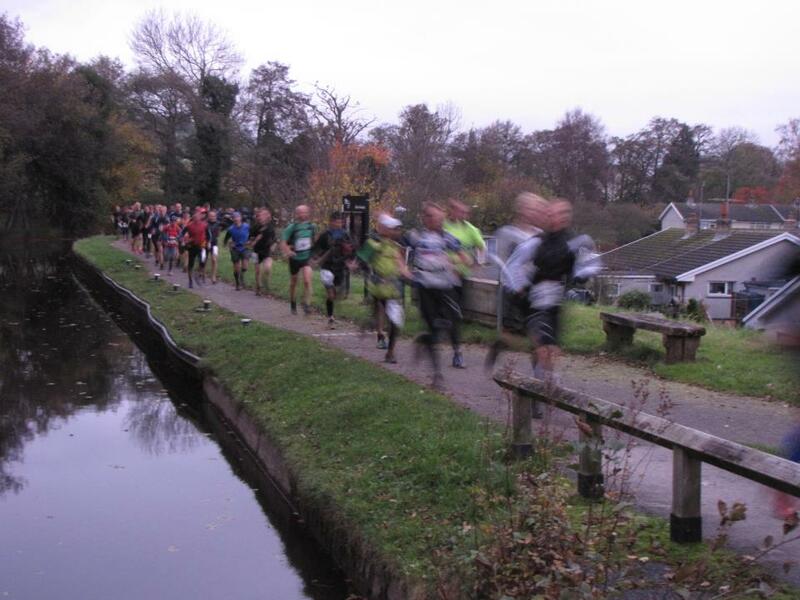 Last year I clocked an average pace of 7:40/M for the front runners along the 3miles of the canal. This year we were running at 7:20/M. The pace looked too quick, but I felt comfortable with it so decided to go along with the ride. After 1mile Pete and another runner pulled away from the front of the group and started doing ~7:00/mile. I was quite happy hanging off the back of Shaw and James with Karl and I believe Mark Palmer and Martin Cain just behind. As we approached the canal turn-off Mark made his move. As we started running up Tor Y Foel (500m) Shaw and I managed to keep within about 20m of Mark and although the distance stretched to 50-70m by the summit we’d had a really good run up the hill with limited walking and I’d clocked I was already around 3mins up on last years split. I knew both Mark and Shaw would be awesome on the uphill sections – Mark from his BGR background and Shaw having done a recce with him a month earlier. Shaw and I were now holding 2nd and 3rd behind Mark. Gear and Nutrition: I’d made a few changes this time around. Last year I had an inov8 elite backpack with a 2.5ltr bladder full at the start. This year I’d used a more (arguably) practical backpack – the Raidlite Olmo5. I had a 750ml bottle perched in its strap holder at the front and generally lighter (compulsory) race equipment stashed in the main compartment. I also had a 2x200ml gel flask waist belt, with a small pocket containing pain-killers, Elagen pills and rehydration tablets. Overall backpack+waist belt weight came to 3kg. With 1kg less body weight I was carrying 3-4kg less than last year. I ran in my inov8 roclites with 2XU compression calf guards and shorts and a helly hansen ls top. As well as the 750ml bottle (which was topped-up at each aid station with a zero tablet), I had a piece of marzipan and some kind of ‘protein ball’ I’d been recommended beforehand. I like a bit of protein in a race but this thing was almost impossible to bite into let alone eat! Most of my nutrition came from Maxim gels (1400cals). Around 1700cals for the race, 260cals/hr. I was a little late getting the liquid on board to start with thanks to the brisk pace at the start and the first climb, and found I needed to drink a lot more in the final 1-2hrs to keep going. No glycogen ‘slumps’ amazingly. The mist had closed in at the top of Tor Y Foel, but it didn’t stop the marshals on the main peaks shouting encouragement as we ran past. The first descent was great fun despite the legs (particularly the quads) feeling mashed from the climb. At the first checkpoint ~6mile Shaw shot off with his full bladder while I topped up. While Shaw was the better climber, I seemed the better descender, and managed to catch up with him by the time we hit the 3mile forest track. It was a good opportunity at this point to see how far we were behind Mark and in front of 4th. There seemed to be around 400-500m in both directions. Shaw and I were both still in good spirits although I was already running on fatigued legs and realised it was going to be a long, tough race. We lost sight of 1st and 4th on the approach to ‘The Gap’ at 12-14mile. It was only a gradual climb with one gulley but the surface was stony and required a fair bit of dodging of the larger stones if you valued your feet and ankles. Once again we ascended into mist and met another of the marshals. We were told we were 5mins behind Mark and decided just to run our own race from this point. The 2mile descent from The Gap is my favourite part of the race. I love descending, especially over rough terrain. A few wobbles but a much speedier descent than last year when I had lens problems and had to use the campervan at Checkpoint 2 to dislodge it! We tore down the hill and through CP2 without any major problems and continued through the various fields and road sections to the start of the canal once again at Pencelli. It was good to see an old friend marshalling on the bridge. Running along the canal we were back on 7’s and our average pace for the race was close to 8:00/M which seemed fast. I was also starting to feel quite fatigued and unsure how I’d handle the second loop. Shaw in contrast still seemed full of beans and I focused on trying to stick with his pace. The chats we had in the first loop were no more, in fact I think the last time we spoke was on the climb up Tor Y Foel for on the second loop. I told him I was going to run/walk, and he said something similar. We were too tired and beaten up from the last lap to continue any conversation. We were friends and in the same team, but it’s still a competitive individual race so I started to have thoughts about how I might get ahead of him, and I’m sure he was thinking the same thing. He’s a lot younger than me and probably has speed on his side so the earlier I broke him the better. Hes a tall lad with a backpack twice my weight so I thought I’d go extra hard up Foel to test him out. If you’d seen me in the final 5mins up Foel you’d think I was pumping weights in a sauna. I was gasping for air and sweating like an american chasing a bus . I didn’t want to look back too often in case Shaw thought I was cracking (although he seemed to have his head down as much as me) but everytime I did he was still there giving it hell. When I reached the top of Foel my legs were like lead. I could still move them but it was slow! Once on the descent I let myself succumb to gravity. I tried to make sure the knees were not locked on the descents to reduce tension. On the approach to the next aid station I kept the pace as high as possible with the aim to get the bottle topped up and then drop out on to the 3mile forest track as quickly as possible. On the first lap we ran 7:40/M up the track. This time I pushed 8:00/M and as it kicked up at the end I surged once more. While running up the road I looked back one last time and couldn’t see Shaw (he later told me he could still see me disappearing into the mist at The Gap). The run to The Gap on the second lap was the worst part for me. I felt like I had to push myself over what seemed like a never-ending trail of rough stones. But I knew that once I reached the summit I’d have a fun 2mile descent and then just over 6miles of fields and road/canal to the finish. I went hard off The Gap to make the most of the downhill. I had been told at three different points that I was 6mins behind the leader. I was surprised at this, it meant the gap between us had been unchanged from 20-40miles. I started to wonder whether Mark had been struggling and whether it was worth pushing a little harder. But then he could have just been conserving his energy knowing his position was safe – a more likely scenario. I topped up the bottle up at the final aid station and working hard over the final 6miles. I don’t think I stopped to walk at all. I felt much better than last year and found that liquid intake was perking me up even more so I made fast use of the 750ml electrolytes! On the canal for the final 2miles I knew I probably had 2nd in the bag, although it didn’t stop me glancing back for Shaw several times. A local runner came by and we had a chat for a while, funnily enough he was from around my area near Kingston. On the approach to the bridge into Talybont I realised I may be on for a <6:30 time. I picked the pace up a little and finished in 6:29:05. Shame I didn’t sprint for <6:29 because I felt really good. I was greeted at the finish line by Martin, Sue and Mark….still in his racing gear, so I’d done well! Marks winning time was 6hr16, a new course record. Shaw came home 4mins behind me in 6hr33 to take third. There were six finishers under the 7hr mark this year (only 2 last year) which shows how the standard has risen. 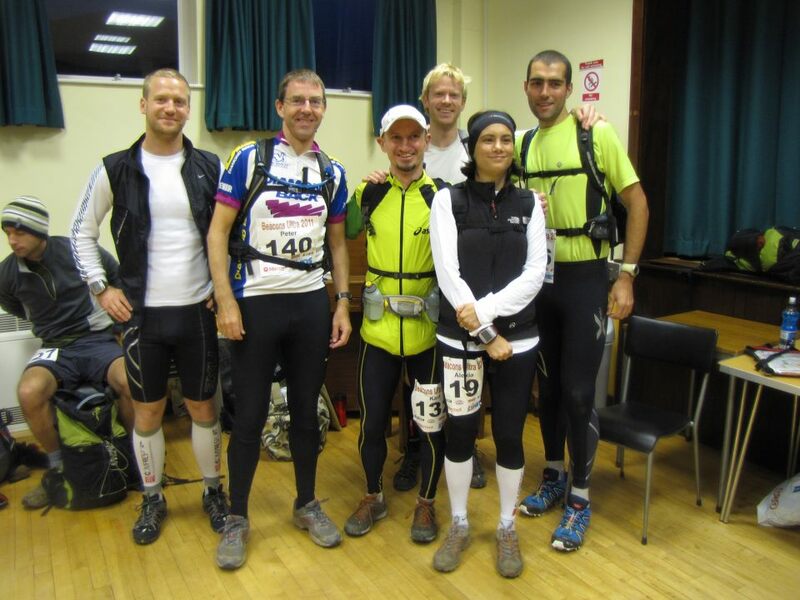 James was the next home for the Elagen Ultra team in 7hr15 (8th), followed by Pete, Karl and Jo. Pete struggled with an enormous blister which made his race very painful and Jo had stomach issues, but Elagen Endurance and Elagen Elite had decent aggregate times so I was excited to see how we did. The rest of Elagen Ultra had a great day with massive PBs from Paul and Lex. A great day overall. We finished the day with a few beers in the local pub. I then drove back to my folks via their local chip shop. We later found out that Team Elagen had scooped 1st, 3rd and 6th. This was as good as I could imagine and perhaps is testament to what a wonderful product Elagen Sport and Beta Alanine really is. I’m hoping most of the team can return next year and we can improve on our times. I had a great time on what was my final race of the year. A 1st at Caesars and 2nd at Brecon Ultra is much more than I could have hoped for and if it wasn’t for that pesky Mark Palmer ;O) I’d have won all of my Ultras(4) to date. I guess now the 12 months are over I can no longer call myself an ultra trail newbie. If this year was a 50/50 between triathlon and ultra trail running, 2012 will be more ultra trail based. My heart is set on it and I’ll be spending the winter building up the mileage and using swimming and cycling as a filler or recovery work for the running. I need to start doing some decent mileage/week and researching fuelling and run/walk strategies. I’ve made some good friends in ultra trail running over the last couple of years but Jo Kilkenny has been awesome in providing info and joining me for the occasional run. A very talented lady. I have already entered a number of races in 2012 but I still have a big decision to make – Grand Union Canal (GUCR) 145M or Ultra Trail Mont Blanc (UTMB)? I have the qual points for UTMB, but I’ve made the ballot for GUCR. I’m currently leaning on GUCR as its closer to home, a chance to practice some strategies, and get a good 100m split on record. I also want to have Henk throw abuse at me towards the end of the race. It’s the kind of abuse you can’t buy. If anyone has any thoughts on this decision it would be much appreciated. It’s been a great end to the year and I can’t wait to make bigger plans for 2012. You only get one life so make the most of it!